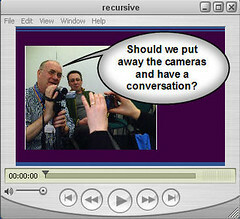 Paul captured this moment brilliantly in text and digital stills here of David Wilcox and Nick Booth video blogging each other. I had been thinking it was an isolated moment of geekily recursive silliness, but today I got a ping from Lucy Hooberman, also from the UK, about a post she wrote that observes that so many people are live blogging conferences that it produces a lot of documentation of the event. The technique (Live blogging) finally seems to have caught on in Davos. Everyone is blogging about what is going on in Davos to the point that no one has time to talk face-to-face anymore because they need to rush off and record the last great thought. Inviting bloggers to Davos is a good thing as it means those not attending in person can participate in the discussion and it makes the whole thing a bit more informal. But by the time I arrived on Wednesday, there were already one million blog hits for “Davos 2007.” At this rate, we’ll all be able to stay home, prevent climate change and just send our avatars to Switzerland. This calls to mind a debate in the educator community about some years ago about computer-mediated experiences - and how it is a (mostly) bad thing. Has this view been changed by the pervasive Internet access? People are blogging so much do they have time to talk to anyone, or each other? I noticed this first at TED last March. Is there a polite way to interrupt a blogger to say hello, or even try and talk? Guess you have to send a comment! At Netsquared last May Ethan Zuckerman spoke on a panel and blogged brilliantly at the same time - so he did have time for a chat in the corridor. I think I am onto something. And back to David Wilcox's posts about blogger actvists preparing for a conversation. So, the question isn't should we put down our social media tools and have a conversation? I think it is how do we use our social media tools to extend the conversation and bring in other s both online and offline. David Wilcox wrote his reflections on our workshop in Birmingham two weeks ago while stuck on a train enroute back to London. He's spot on. I have been processing my experience and wanted to reflect more on my instructional practice, something I used to do regularly. It also reminded me how I still am not yet able to reflect in action 100% of the time. I also thought of a book title from about ten years ago called "Learning and Forgetting"
I went a little overboard on the 80-plus powerpoint slides. What I didn't externalize at the time (I'm off the charts Intuitive and slightly Introverted) was that the process of creating a powerpoint - translating the ideas into visuals - was for my own preparation. Once I get in the room, we throw away the slides. I really liked having "wikitation" (A wiki that you can use for a presentation) for the content See Social Media wik) The wiki worked well because it put a lot of links and some visuals as jumping off points for discussion. I didn't really do a presentation - I tried to do an "interactive presentation" where you are involving people in a discussion. It also helped in terms of getting a sense of where people were at and facilitating some sharing of stories. Most of the content questions were familiar, but I got a few that are still making me pause. "How much time do you spend online?" and "Should one be worried about having so much of your 'thinking outloud' and photographs on the Internet. Do we need to worry.?" Dion Hinchcliffe presents a great visual illustrating the difference between traditional/mainstream and social media. It made me think of how many times have I heard crusty old nonprofit technology consultants, "Social media, no body knows what that is?" 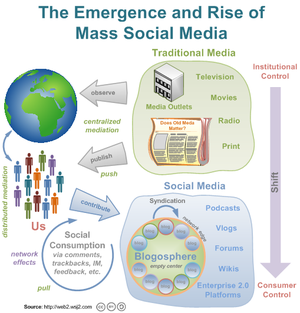 Hinchcliffe goes on to give us a clear definition for social media with pointer to wikipedia's definition and emphasizes "The key here is that people are the ones that use and control these tools and platforms instead of organizations and large institutions." Of course, any effective technique or phenomenon has those who attempt to co-opt it or copy it, the latter which is the most sincerest form of flattery. The recent Public Relations 2.0 flap, which ostensibly boiled down to whether or not traditional organizations can even conceive of how these new freeform platforms work, was a good example of how institutions firmly grounded in the 20th century struggle to understand the power shift under way. Because these platforms are no longer under anyone's control for the very reason that the Web is a system without an owner, except all of us together. He goes on to ask: "But how significant is this really? What are the compelling datapoints that tell use that social media is changing the landscape of communication, collaboration, and personal interaction?" In the next few paragraphs, presents statistics that illustrate the "mainstreaming" of social media - like this google trends for podcasting. He lays out the ground rules for Social Media. 1. Communication in the form of conversation, not monologue. 2. Participants in social media are people, not organizations. 3. Honesty and transparency are core values. 4. It's all about pull, not push. 5. Distribution instead of centralization. When users are in control via the highly democratizing tools of the Web, the fundamental ground rules change. Understand them, follow them, and embrace them, this is the pre-eminent media model for the 21st century. 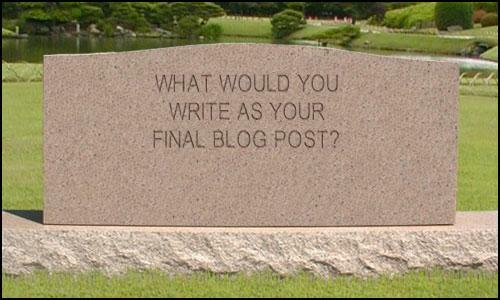 Write down your blog’s obituary. How would it read if your readers were to write it? How would it read if other blog's in your field were to write it? What would the world look like if your blog didn’t exist? If you were to stop tomorrow, who would miss your blog and why? Have you made any real difference for your readers? I'm the session designer for the video geekout session at NTC and today is the deadline for the outline submission. I got a couple of rock stars from the video blogging community with us - Jay Dedman, Ryan Hodson, Jonny Goldstein, Andy Carvin, and Robyn Tippins to lead the session. It's been fun to bounce ideas back and forth with Jay and everyone, particularly in light of their extensive experience teaching folks video skills. Steven Parker is doing some cool stuff with video. Not only on his blog, Network Learning, but embedded into a wiki. Check out his Group Learning page where he walks us through how to facilitate a tech learning session! The rest of the wiki is also a great resource for those looking to integrate tech into learning -- or anything else. The stuff has "good bones" to be applied in varied settings. This is an excellent example of "rich media" documentation. Meet Susan Silverman. 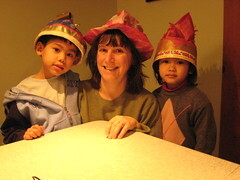 I met her like ten years ago when I leading training workshops for arts educators, artists, and arts organizations throughout New York State on how to use the Internet. I was teaching Web1.0 skills like how to search the Internet, how to manage email, how to build a simple web page with HTML, and other good stuff. 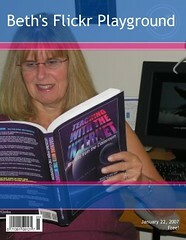 Susan was doing these amazing collaborative, user-generated content projects over the Internet. I remember her community of clocks project -- she facilitated content creation from schools around the world on the theme of clocks. These projects were done nearly ten years ago, but they presage what the social web, participatory media. I wonder what lessons or techniques can be learned from her practice that can be applied with the next generation of tools? How much has our environment, culture, or information overload changed? I was really excited to find her photo contributed to one of my flickr groups! 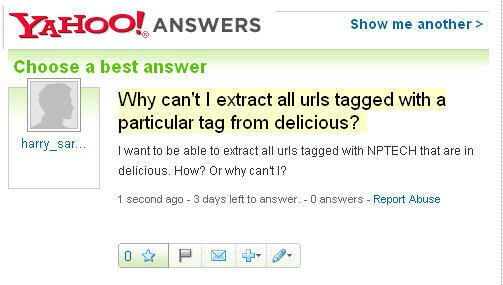 Can Yahoo Answer My Question About Del.icio.us? That's what Allan Benamer and I want to know. Why? To play with the data on dabbledb, swivel, or many-eyes (see what Chris did here). The context is here. I've been working in the nonprofit tech field since 1993 and I've faced the issue of "cranial containment." My brain just isn't big enough to hold all the information about all topics that I need to know. So, one method is to find people who are experts in a topic and take advantage of their expertise. I'm lucky that Laura Quinn, an expert in nonprofit software, shares expertise via Webinars in collaboration with NTEN. Last week, I sat in on the Idealware/NTEN Webinar "Getting Started With Online Donation Tools" because I need to prep myself for my board meeting. In fact, looking down the list of upcoming Webinars - I really need to go to all of them. If your organization is struggling with software selections for online fundraising, databases, or newsletters - it is well worth your time and money to sign up for these webinars. It's great to be able to ask your specific question and get it answered. Also, the idealware site has many excellent articles you can back and re-read and better understand or read before the webinar to go in better informed. A few weeks ago, I had the opportunity to go to the UK to present a workshop on Social Media with David Wilcox at the UK Circuit Riders Conference. 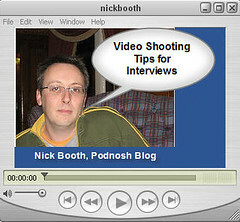 I also had a chance to meet Nick Booth from Podnosh, High Fibre Podcasting. Nick is a journalist with a background in documentary making. I asked him for some video shooting techniques for interviews and he kindly gave me and David some excellent coaching and shooting pointers. 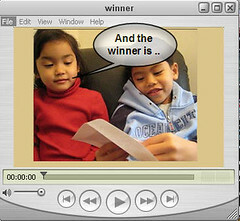 My video blogging has mostly been about "moment capture" from professional conferences. I am mostly live blogging with text and photos and then I capture a video clip or soundbyte from someone who was in the session, a speaker or participant. As a beginner, I've only been able to think in sound bytes from a single shoot because I wanted to have the editing process be easy and efficient. Nick gave me some tips on how to integrate interviewing techniques with camera angles that makes your editing work easy and could result in a better a good final product. There is nothing like getting some one-on-one or small group coaching from a pro. This is why I'm organizing a video geekout session at NTC -- we'll have some of the rock stars of the video blogging community with us - Jay Dedman, Ryan Hodson, Jonny Goldstein, Andy Carvin, and Robyn Tippins. What are your most useful synchronous online facilitation practices? TechSoup holds regular meetings for nonprofits in Second Life and I have been attending regularly and sometimes facilitate like this I did this past week. So, I've been reflecting about effective facilitation of virtual meetings in Second Life Right now the primary method of group interaction is via unmoderated chat interface. Sometimes it doesn't support the process of collaboration effectively for all the reasons we already know. But there is also a trust issue too -- particularly if you don't know all the avatars in real life. Given that you are starting a virtual representation of people - you may be proned to projection. -If you need multiple lines, use .... at the end of your phrase to indicate you're not finished. This protocol might make some aspects of inworld chat only meetings smoother and less multiple threads, but introducing it into an established group's meeting practices might be a little like herding cats. I also find that I reach cognitive overload with the SL chat client pretty fast because: 1.) chat history flys by and I'm scrolling back to catch up 2.) The chat window I'm reading covers up the screen if I want to reach the history without scrolling, so I have to move it around to watch what is happening in world 3) I have to translate the avatar name to real person name and relate to agenda or summary notes that I'm taking elsewhere. 4) There isn't a place inside of the virtual world where you can easily post the agenda and I haven't found a virtual flip chart yet. It kinds of gets in the way of effective facilitation. I also don't like using chat alone because it sometimes can get chaotic, leads to miscommunication, and feels so slow. That slowness is great if you want to immerse in a conversation where you reflect and explore, but it can be really annoying if you're trying to come to agreement, determine actions, and make decisions. I've always had chat as a back channel to a conference call and used it to summarize key points as a sort of electronic flip chart. There I go again, wanting a virtual flipchart. At Friday's meeting in-world, someone brought along their roundtable with expandable seats. It worked for me because of the clock technique we often use to facilitate conference calls. Now, if I could just find a flip chart in SL that let's you type in the summary of key points - I'd be a happy. That's why Nancy White's post on most useful synchronous online facilitation practices really caught my eye. So, I read it with this question in mind: What techniques can be applied or adapted to Second Life facilitation or virtual world interface facilitation? How does SL compare to these other tools and where does it fit on the gradient? And, how does a virtual world tool help or hinder effective online collaboration or a synchronuous online communication? This is interesting to me because Second Life is quite the opposite - there is a huge investment in learning the tools, there is no audio (although that is changing) and it is all visual. How much does this help or hinder effective collaboration? How might it influence your choice of using Second Life for a project? The reason to have something beyond the is two fold: one is to increase our engagement and participation, particularly for those of us who are not great in an aural-only mode. With a visual, I'm less apt to start doing my email or staring out the window. For the same reason, I love my cordless phone because I find I listen to long phone meetings better when I can walk around and move away from my computer. It does something to my thinking. I'm still hard wired for VOIP calls and, despite the price, I am tempted to get a bluetooth headset for the computer. I'm very similar to Nancy in that I have attention issues with aural-only mode. But, I'm also finding when I don't any aural mode for group collaboration meetings - chat only - I start to have similar attention issues. So, that's why I like having both the visual and the aural. The second reason is other tools can support the process of the meeting or gathering. Using a chat room to collectively take notes, or a wiki to evolve the agenda and take notes during a meeting. Co-editing WHILE discussing a document. Queing up questions in a larger phone meeting via chat so that a) you know you are on deck to speak and b) people have a chance to be heard, especially if they are less inclined to jump in to a conversation. This gets me back to wanting that virtual flip chart. Another thing that happens and I know there is probably a way to prevent this - is that our meeting are taking place in a busy place where visitors often come by who are not involved in the group. The other day, we had someone come by with their virtual dog who fetching a ball. It's cute, but it flooded our chat transcript with "woof woof." Now, I'm a huge dog lover, but it disrupted the meeting. When you get to the place where you are doing larger meetings (over 8 or so), or are doing ongoing live meeting practices, it starts making sense to consider more sophisticated tools and pratices. This is where things like web meeting tools, co-browsing, and such can be useful. What I notice about web meeting tools is that most of us don't know how to make the most of them. We may learn how to use all the tools and features, but we haven't had exposure to good facilitation practices. We try and duplicate offline experiences (be they useful or not) and not really take advantage of the medium. Of course, the meetings I'm attending in Second Life are related to planning and implementing projects in Second Life. So, while some aspects of the interface are annoying - as I've outline above -- it comes back to a question of "What makes for a good facilitation practice in Second Life?" Given that it is a virtual word, do online facilitation techniques used in RL or other types of online applications make sense? How can we take advantage of the medium of Second Life? I keep coming back to damn virtual flip chart. I posted a question on the educator listserv and there doesn't seem to be one. yet. Nancy's post continues with some observations about synchronous online facilitation techniques gleaned from reading "Learning in Real Time" by Jennifer Hoffman and Jonathan Finkelstein. What I notice is that Jonathan writes about something I learned from my colleague, Fernanda Ibarra. It is the masterful use of a shared white board to move people from being consumers of a meeting to being active participants. Fernanda showed me how she prepared a whiteboard screen with clipart of a circle of chairs. As people entered the web meeting space, she invited them to write their names under a chair. This helped orient them to and practice with the tool, created a sense of "group" and gave a visual focus as people entered the "room." It was brilliant. I've riffed on that idea and found it very useful. We've done After Action Reviews with the white board taking the place of a flip chart used F2F. We've even had virtual parties. This brings together , text, and images. This starts to get really excited about the possibilities of Second Life and really using the medium. Now what if our shared table (see above) could also be a shared white board -- our collaborative virtual flip chart. Of course, you'd need the aural channel for it to work. Nancy points to a few good resources on the topic of synchronous online facilitation techniques that I need to explore ..
A lot of people have asked me about those widget fundraising campaigns I did last December. So, if you're interested, you can learn more. ChipIn asked me to write up a formal case study on my first personal fundraising campaign using their tool. This case study walks you through the step-by-step process of using the ChipIn widget to implement a successful a personal fundraising campaign on behalf of any nonprofit organization or cause. The tips and techniques shared in the next few pages will help your organization guide supporters and transform them into effective fundraisers for your organization's cause or program. The case study looks at how to set a realistic goal, crafting an effective message, identifying likely prospects, incorporating social networking sites into your implementation efforts, and how to best use the Chipin widget. He did an interview with me about widget fundraising -- its brief - go take a listen. This week on the NpTech Tag call, the idea of social search was referenced. Nancy White just sent me this note about a conference call on Monday about the topic. Here's the deal: If we can't sort the wheat from the chaff, the chaff wins. If so, the Net becomes a big pit of quicksand. Search engines keep improving, sometimes imperceptibly, but my money's on social search. We'll find our best information from other people, not from software filters. There are many social ways to filter info, from digg (see especially the Diggswarm) and Memeorandum to del.icio.us, blogging, reblogging (see the Google Reader Sharing FAQ) and more. How are people making sense of the torrent of info on the Net? What do you use? What practices have you developed? What is missing? What do you wish someone would build? As always, an IRC Chat will be available during the call, here. A big thank you to Britt Bravo for the Have Fun, Do Good T-Shirt! 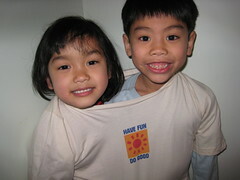 I've now launched my two-headed blog t-shirt collection on Flickr. Check out Britt's store on CafePress. CafePress.com is an online retailer that produces and dispatches a large variety of user-customized products on demand. Opening and operating a basic CafePress shop is free. A basic shop can be upgraded to a premium shop for a small monthly rate, allowing an unlimited number of products per type and additional maintenance and customization features. 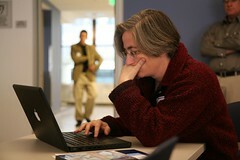 photo of Lucy Bernholz live blogging during the Northern California Grantmakers Briefing. Photo in flickr from Community Technology Foundation. It's always nice to discover redesigned nonprofit web sites with a web2.0 functionality. Check out the SDCTC Community Portal (is the idea of a "portal" web 2.0 or more like web 1.0?) They are using RSS to stream content, including resources tagged with NpTech tag in del.icio.us. Hmm .. we should add some questions to our NpTech Tag research about how people are aggregating and republishing content tagged with the NpTech Tag. Sundance, the Oscars, and Nonprofit Technology? Katya Andresen from Network for Good gives us the lastest celebrity news (what no gossip?) from Sundance where she was busy running around asking celebs to join Six Degrees and getting them sign swag for charity. Nick Booth, high fibre podcasting blog, points us to some fascinating brain research that has discovered the part of the brain responsible for altruism and he links it to why nonprofits should be using the social web to advance their missions. Nancy Schwartz of the Getting Attention Blog is hosting next week's Carnival of Nonprofit Consultants. The topic is "How do Nonprofit Communicators Compete for Audience Attention?" Jayne Cravens from Coyote Communications offers advice and commentary for nonprofit organizations about online social networking. Specifically she speaks to why she isn't a stronger advocate and some of the issues related to "Second Wave Adoption." Hillary Clinton is using Drupal. Niels' Blog has a post called "Wanted - A President Candidate That Blogs" wondering if presidential candidates understand what it means to have a conversation online and a related post called "How Not To Blog." Last week Ethan Zuckerman was the invited speaker at the Ethos Roundtable and also presented this talk "Looking beyond the US for activist inspiration" at the Berkman Center/Sunlight Foundation meeting. Deborah Finn was at both events and blogged about the latter here. Heather Carpenter from Aspiration has a post titled "Why It Took Us Eight Months To Get Our Network Up and Running"
Phillip Djwa writes about a youth videoconference he is organizing. Michelle Martin writes about her experience as a non-technical programmer creating mashups with some new user-friendly tools. After a brief hiatus from blogging, the studio 501c blog with some great advice for nonprofits on how to explore org.20 practices. The nonprofit blog exchange has posted pointers to the last round of blog posts for the virtual event, along with a summary of nonprofit blog exchange blog posts. Last week I summarized Allison Fine's articulate rant about the Gates Foundation. Now "The Giving Carnival" over at the Tactical Philthanthropy Blog provides a roundup of several bloggers opinions. Northern California Grantmakers Briefing called From YouTube to Podcast: Digital Media, Philthanthropy, and Social Justice was live blogged by Lucy Bernholz here. Anil Dash, of Sixapart, was one of the speakers. You can listen to a podcast of his remarks here. Lucy has more coverage on her blog. The "OpenItUp" blog shares a list of commonly used excuses for not using open source as heard during the recent LASA UK Circuit Rider Conference. A WikiTation is a presentation delivered in a wiki. It can be a great tool for conference presentations -- to present material, examples, or take notes for your session. It also serves a resource leave behind! Alan Levine, CogdogBlog, invented the term and also has some excellent examples here. BlogWikiWeb is the "wikitation" from the Web2.0 session during the Legal Services Conference Technology Initiative Grant Conference. The Net2.0 Unplugged Research an action research project which will explore the question: How do telecentres make 'web 2.0' socially and technically accessible in emerging knowledge societies? The research is being led by Partha Partim Sarker, Co-Founder, Bytes for All. (Blog is here) There are some excellent questions raised about the impact of technology on the way people do their. So, the resulting report should be fascinating. Check out the wiki for CivicCRM Documentation, 2007 Penguin Day Planning, and 2007 Nonprofit Software Development Summit. Ian Bogost takes some of the fun out of video games -- and replaces it with opinion with his "playable editorial cartoons." If you're interested the uses of videogames in advertising, politics, education, and other activities, check out Ian's site, water cooler games. Live blog notes from a session at Northern California Grantmakers briefing about Virtual Worlds and Video Games here. Need a chuckle? See this one-page parody of Second Life. John Kenyon tells you why video blogging is useful for nonprofits. John Kenyon was also at the LASA Circuit Riders Conference in Birmingham with me earlier this month. We went to a pub with some David Wilcox and Nick Booth, ordered up a few rounds of drinks, and had a fantastic conversation about social media and nonprofits. The type of conversation you have with your peers about your work that you can only have face-to-face. I pulled out my video camera to do some moment capture. The NTC Conference is a little more than two months away and I'm really looking forward to conversations with colleagues and meeting others face-to-face for the first time. While one might be tempted to discount the value of face-to-face gatherings when we have the Internet, some of my most valuable connections and learning experiences have taken place "in real life" at the NTC. There is just no replacement for face-to-face connections. I've volunteered to be a session designer for two (yikes!) sessions and I'm in the process of organizing a third, an affinity group meeting! I'll be collaborating with colleagues online to further plan our sessions and online materials. So, in the spirit of thinking outloud, I'm sharing these works in progress here and welcome any comments or reactions. Those of us that provide technology support for nonprofits get asked a few questions over and over (and over and over) again. Screencasts are a great new way to answer simple how-to's and record the answers to those frequently asked questions for posterity. A recording of your , the image on your screen, and some additional elements, screencasts are perfect for explaining how-to's for your applications and other specific, tactical uses. In this session we'll explore some uses for screencasting, the tools you'll need to create one, and tips and tricks for making them work. Seems like video is obsession this year - so the other session is going to be a geekout, hands-on session on video blogging for nonprofits. Jay Dedman and Ryanne Hodson (well known video bloggers and authors of books on the topic) have will be leading the session, along with Andy Carvin and Jonny Goldstein, also accomplished video bloggers. The session will be very hands-on, participants will be encouraged to their cameras, laptops, and clips. I'm hoping that video blogging can be spread to the nonprofit sectors - as a way for organizations to tell their stories and document their work. The latter is something dubbed "Rich Media" or "Social Reporting"
This is a great opportunity to learn from some key learners in the video blogging field. The planning wiki (very much a work in progress right now) is here. I'm the moderater for the NTEN online affinity group that focuses on Flickr for Nonprofits. (It's free and anyone can join, so if you are curious about nonprofit applications in flickr, come subscribe to the listserv and if you're going to the NTC, come join our meeting). I read in the NTEN newsletter where there was call for Affinity Group Meetings. So I sent out a trial balloon on the list and in our flickr group discussion area. The Flickr for Nonprofits Affinity group will meet in Washington, DC to share experiences, tips, and ideas about how Flickr can be used to support nonprofits and their programs. We will discuss flickr, tagging, digital photography, flickr contests, participatory media campaigns, and much more. We will also design a "Flickr Walk" to take place sometime during the conference. We will also organize a flickr collaboration during conference, for example we might take digital photos of the event around particular themes and stream and project our photo stream so everyone at NTC can view it. Mental note to self: I've never actually organized a flickr walk - has anyone? Where do I find more information? Nancy White pinged me the other day asking if I was interested in joining the Guest Editor Crew she is leading for the next edition of the KM4Dev journal. The theme is going to be on something like "Technology for knowledge sharing in development." I said yes because I have always found collaborative online activities with Nancy extremely rewarding, it is an opportunity to connect with others beyond the US borders, and discover new research/researchers. Net2:Unplugged is an action research project which will explore the question: how do we make make 'web 2.0' socially and technically accessible in emerging knowledge societies? The project will provide direct support to three telecentre networks who want to use these new approaches to organize their members online. We will learn about what works and what doesn't alongside these networks. The Idealist, a project of Action Without Borders,connects people, organizations, and resources to help build a better world. If you want to get involved in social change issues or work with nonprofits anyplace on the globe, the Idealist is one of the first desinations on the web you should visit. The Idealist recently launched a new initiative, Can You Imagine a Better World? Next week, participants from all over the world are holding start-up meetings to imagine, connect, and act! Action Without Borders is an 11 year-old nonprofit organization with an amazing history of accomplishment and growth. I recently tracked down several women who work for the organization in their New York and Buenos Aires offices, including Lorene Straka, Joanna Eng, and Mari Velasco for an interview. 1. Lorena, you've worked for the organization for almost 8 years, starting as an intern and moving to Chief of Staff position, what was your background prior to your internship? Why did you decide to intern for the idealist? 8 years! Wow. It all started with a subway ride...I met the founder, Ami Dar, on a subway two weeks after moving to New York in 1999. During our commute uptown he very, very briefly told me about the Imagine project and I was intrigued. As part of this bigger project, he was looking for an intern to research countries that didn't allow their citizens to create nonprofit organizations. When I joined, we were a staff of three, and we're now at 55 in two countries: the US and Argentina. It was, and continues to be, a great crew of people. We're about harnessing every resource and tool available to promote connections between people, ideas and resources and the more ways to do that, the better! We're a small organization with limited resources, but we're creative, ambitious and are doing our best to keep up and capture the best of what's out there. We have made some recent changes to expand our use of new web tools, but there's always more we could do! We have started to make our presence known on social networking sites such as Facebook and MySpace, and we're encouraging people to use sites like Flickr and YouTube to share their photos and videos with the Idealist network. We'd still like to do more, though, to integrate these tools into the flow of our website. We've also started using a wiki for a volunteer research project, and we'll probably expand our use of wikis in the future. The wiki model has great potential for us: since we are always looking to share resources through our website, why not make it easier for the public to contribute great ideas and resources they know about? The key with all of these new web tools is that they help us make our work more collaborative, help our network come alive! 3. Can you tell me some stories about how your organization has connected people, organizations, and resources to realize change? I am originally from Ecuador and have two stories about connection. I lived at the Galapagos islands for 2 years and last year a friend who runs an important NGO in the islands wrote me thanking me because through Idealist he managed to find 2 volunteers from Spain to work on a project about organic agriculture. He said he felt it was going to be impossible trying to find people from a little island in the middle of the Pacific ocean and that he was thankful that there's a site like Idealist to connect people all over the world, and that it works! The other story is from another friend who is the executive director of a great NGO (Fundacion Futuro del Ecuador) that works with indigenous communities living on the highlands, helping them have access to decent health care system. They empower the communities so they can run the program themselves through "cooperativas" and she needed desperately the help of volunteers for a nutritional project to complement the health care program, and two argentinians from Patagonia traveled to Ecuador to give her a hand with the project and they have done amazing things and had a great life experience. This happened from the connections they made on idealist. 4. I understand that there will be over 200 start-up meetings in 53 countries scheduled for the week of February 5-11. What are are some of the common themes? Most are about improving their communities and networking. There are also meetings focused on youth, sexuality, volunteerism, and persons with disabilities. 5. What else would you like to tell us about your organization or programs? Come take advantage of this amazing oportunity to connect with people in their communities (and all over the world) to work together and improve the place where they live. This is the best way to empower ourselves and to pass our enthusiasm to others. The world can really be changed by the power of positive and active people working side by side with the same objective.